Another Add-on for Hands of Fate goes live! 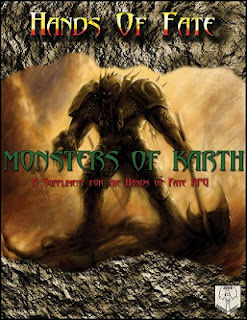 Finally finished the Monsters of Karth booklet for the Hands of Fate RPG, and there's some amazing artwork from Joe Calkins, Cerberus Art, and a few others from the Golden Age of RPGs. As you can see, the cover work looks fantastic! I had purchased an art pack from Cerberus Art and guessed there would be 2 or 3 pictures in there that I could use, as is usual with an artpack that I pick up, but was very impressed with a lot of the work therein. The pictures were from the artpacks Cerberus Stock Art: A Decade of Fantasy and Cerberus Royalty Free Clip Art Pack, and are of excellent value. I drew a ton of inspiration from these pictures, and was pleased to find that almost all of my monster entries in the book were able to have pictures matched from the art packs. Tons of Undead, both corporeal and incorporeal. New Armour and Weapons, plus a new Animism Spirit of the Wilds! So, what are you waiting for? GO GET IT!! HoF Print on Demand version in the works!